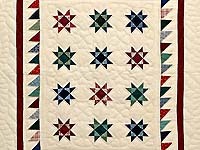 Amazing collection of patchwork block designs on a small quilt. Note the special care taken with the patchwork piecing and quilting. Made by Lancaster Amish woman with fabrics selected by Hannah. Includes a sleeve for a hanging rod. 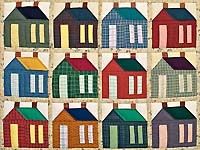 Colorful collection of the traditional Schoolhouse block. Great fabric selections. 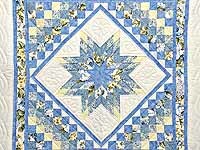 Nicely pieced and has lots of fine quilting. Great quilt for a teacher! Bigenough to be used as a throw or wall hanging. 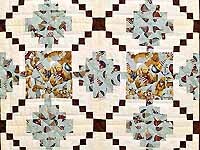 Delightful quilt made with exceptional care. Note the extraordinary amount of patchwork piecing and the fine fabric selections. 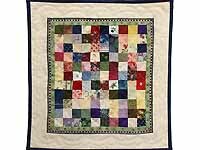 A charming quilt that will become an heirloom! Made in Lancaster by an Amish grandmother. Stunning! Lovely fabrics and a great design to show them off. Well made by a Lancaster Amish woman. Note the special care taken with the patchwork piecing and the quilting. Includes a sleeve for a hanging rod. A delightful jewel for that special niche. Note the excellent patchwork piecing and fine quilting. Made by local Mennonite woman. Even includes tabs for a hanging rod! Delightful rendition of classic design. 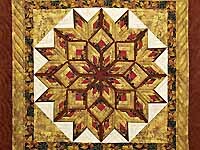 Wonderful fabrics, careful piecing, and fine quilting. 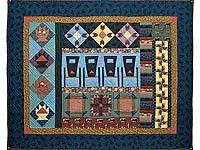 A great quilted wall hanging for any home! Made in Lancaster by Amish woman. Includes a sleeve for a hanging rod. 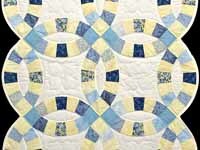 Wonderful patchwork design with attractive blue and yellow cotton prints. Very well made by local Amish woman, note the care taken with the patchwork piecing and the quilting. Includes a sleeve for a hanging rod. 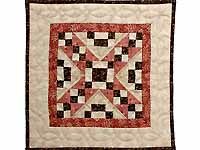 A charming small classic quilt that can be used as a table throw or wall hanging. Lovely fabric selections. Nicely made by Lancaster County Amish woman. 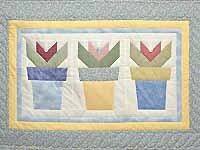 Wonderful little quilt for that gardener looking for a burst of color in winter! Nicely made by local Amish woman.